Here's a list of our sightseeing walks around the city. Scroll below and see what catches your eye! Click on a tour for more detail and click the Book Now button to see when the next public tour of that specific walk is scheduled. All of our walks can be set up as private tours as well! With great views, awesome mausoleums, and deep links to the 19th Century Green-Wood is an amazing way to step back into the past. As the final resting place for many New Yorkers this two hour tour runs the gamut from Coney Island showmen to famous politicians to eccentric poets. You'll also see some tiny pyramids and a parrot or two. Bigger than Monaco and with 58 miles of path it's easy to get lost in Central Park. Hang out with us and we'll show you the main features of Olmsted & Vaux's first park in this two hour walk. Expect androgynous angels, elm lined malls, and lots of beautiful scenery. We'll also talk about phrenology in the 19th century and shanty towns during the Great Depression. 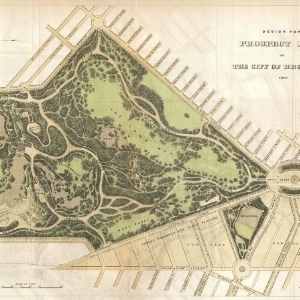 Everybody loves Central Park, but Prospect Park is the space Olmsted & Vaux got to built with more money and more say in the construction. We'll talk about how the parks are different while also having strong similarities. Hidden puppet libraries, hidden grave sites and Revolutionary War battles are just some of the things we'll talk about during this two hour walk.